SmartLock Explodes With Dye If Cut | OhGizmo! I grew up in a fairly small town, so when I rode my bike around, I never bothered to lock it up to anything. Of course if you live in a large city, it’s not uncommon for your bike to speed off with another rider if you aren’t careful. Even a decent bike lock doesn’t always deter thieves, since a nice pair of bolt cutters can generally take care of it. 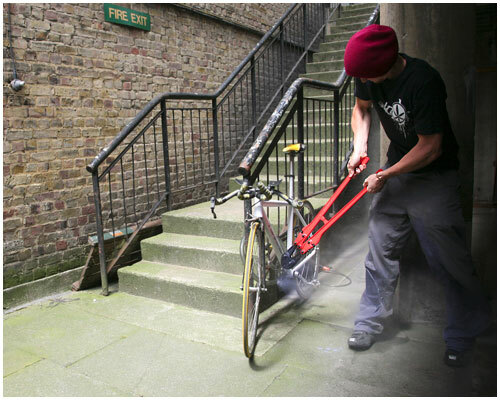 Well here’s a lock that will make a would-be thief seriously regret messing with your bike. The SmartLock works much like any other, just wrap it around your bike and something immovable. However, the real fun begins when someone decides to cut it off. See, the entire cable is filled with compressed air and liquid, which will explode outward when it is cut open. The person is then covered with dye, and an invisible forensic property marking liquid. Sound familiar? It’s the same principal behind those tags you find on clothing in many stores. It’s only a concept for now, but seems like a brilliant idea. You know that sooner or later the outter coating on this will wear out and the compressed gasses and dye will be all over the owner/user of this lock. is that right mate? then they should sort out that problem then.. I would sincerely hope that the lock material would be strong enough to contain the innards. My concern is with how cold the lock could get without affecting the dye inside. I would want it to be able to sustain sub -30deg (C/F) temps.